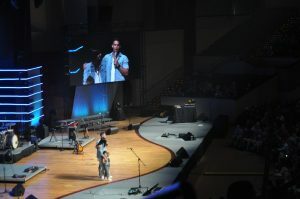 Davey Blackburn introduces his wife, Kristi, and children to the Momentum audience. “Authentic resolve is not just verbal, it must be visible,” said C.L. “Shep” Shepherd, addressing the Friday morning main session at Momentum Youth Conference. 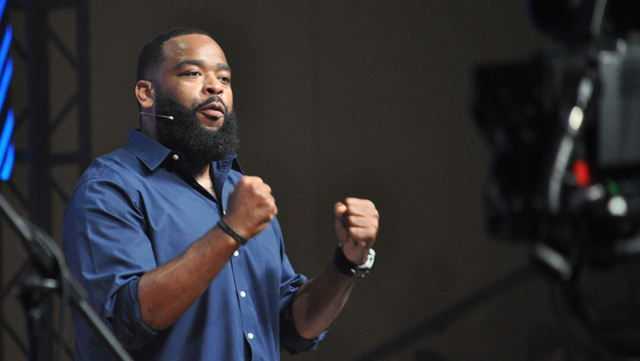 The former student-athlete and professional football player recounted his growing up years in the ghetto. Raised by a single mother, he remembered days with no food in the refrigerator, washing up in the school bathroom because there was no water at home, being sexually abused by his Sunday school teacher at 10, and not knowing anyone in his father’s family until he was 12. “I was born into the struggle, I never felt I had a voice,” he stressed. At 14, his mother asked him to be the “man of the house.” He didn’t know what that meant, other than he was caring for his little sister. That was the year he also decided to commit suicide until the words painted on an Orlando wall came to mind and Jesus grabbed his heart. “If its true, if God raised Jesus from the dead, that means he can raise you from any situation,” he told the students who were gathered in Chapel Auditorium at Indiana Wesleyan University. Shep went on to be the first male in his family to graduate from high school and the first in his family to graduate from college, earning two degrees along the way. After college, he signed a contract to play professional football. He traces all that to the decision to follow Christ at age 14. Also on Friday morning, Davey Blackburn returned to the Momentum platform to recount how God is the perfect storyteller. He talked about how Christ died on the cross and rose on a Sunday. Last year, he had shared how gunmen had entered his home 18 months earlier and shot his wife, while their young son was in his crib upstairs. On Friday, he recounted the weeks following her death, how he and his wife and had a dream of connecting their congregation with an inner-city neighborhood. He was led to meet with a pastor from that neighborhood, who challenged him to not only forgive the young men who murdered his wife, but to consider their families. Along the way, he met Kristi, who also had a connection to that same inner city neighborhood. The two married in December.